Scrolling through radio stations on my way to teach art, video and photography at American International College, I landed at community radio station 90.7 WTCC and learned about an upcoming National Black HIV/AIDS Awareness Day event organized by The New North Citizens' Council, Inc. (NNCC). 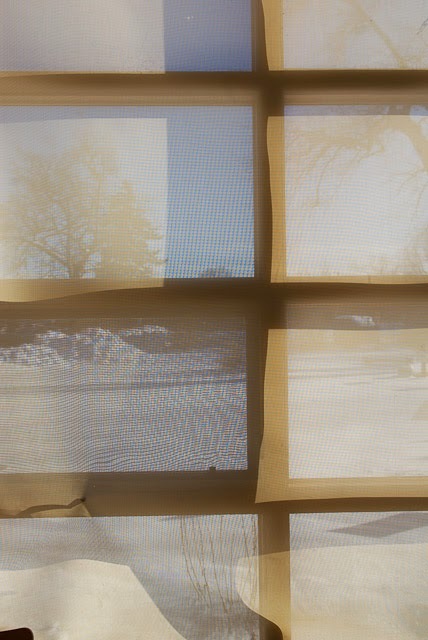 The next day I headed over to the Mason Square Library in Springfield, Mass., to document the activities for The Image Works. 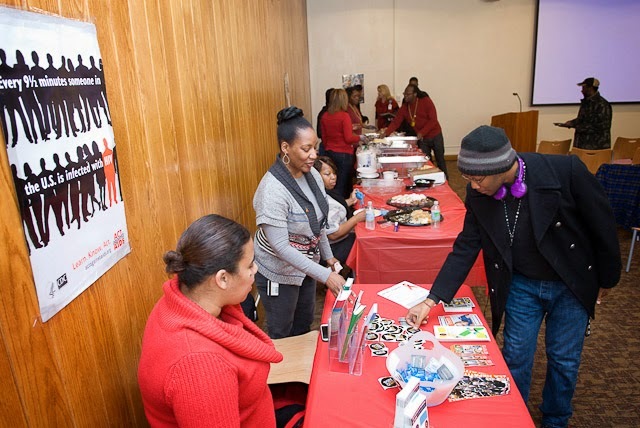 The event featured free HIV testing and flu shots, educational materials regarding HIV/AIDS, along with free hot meals. Part of the photojournalist's job is to make connections and to develop a network of sources and ideas. Fairly new to teaching and photographing in Springfield, I was encouraged by a warm welcome. I asked NNCC Program Director Richard Johnson if the free food was an incentive to draw individuals to the event. I learned that it was not an incentive. "As a community, we tend to gather around food," he replied. 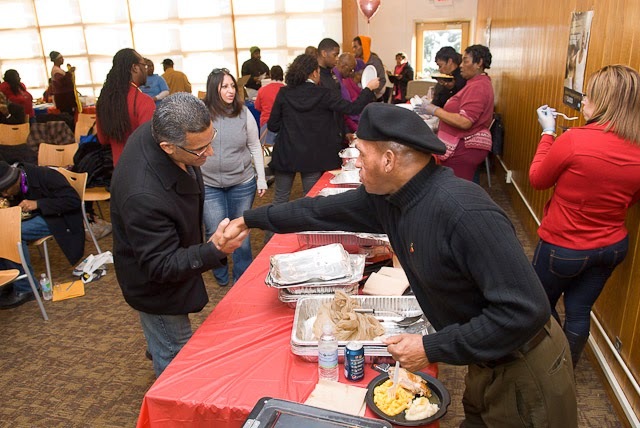 "Not all folks have the opportunity to have a warm meal, so we wanted the opportunity to provide something." The volunteer food servers alternated between urging me to have a meal and to take pictures of them. I declined a meal, as my belly was full. I also questioned the appropriateness of taking food since warm meals are the norm for me. I was especially aware of privilege after recently reading Mia MacKenzie's essay: 4 Ways to Push Back Against Your Privilege. One ebullient volunteer kept after me to eat something. Not wanting to be rude in refusing an offering of food, I said that upon completing my photography, I would have a small cupcake. Work done, I took a cupcake and sat down near the particularly friendly volunteer. However, her lightness was gone. She barely acknowledged me. I then saw she was looking at a projected slideshow of pictures of individuals who have died from AIDS. She murmured that someone had said that an image of her sister was in the show. This personal revelation suddenly jolted me from my detached photojournalistic outsider stance. I began to feel deeply the meaning of music playing, Sarah McLachlan's I Will Remember You. Feeling sad, I took this last shot on my way out: Less photojournalistic precision, more emotional abstraction. The strains of the haunting song lingered in my being. 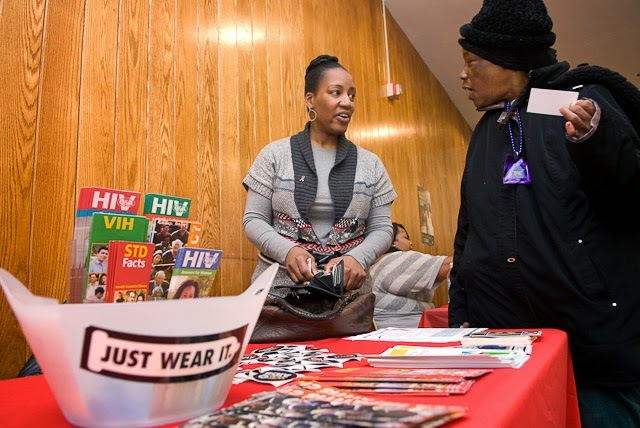 According to the Centers for Disease Control and Prevention, "National Black HIV/AIDS Awareness Day was started 14 years ago to focus attention on HIV in blacks and African Americans, the racial/ethnic group most affected by HIV in the United States. Blacks make up only 12% of the U.S. population but had nearly half (44%) of all new HIV infections in the United States in 2010."